Increasingly, high-assurance applications rely on dynamically adaptive systems (DASs) to respond to environmental changes, while satisfying functional requirements and non-functional preferences. Examples include critical infrastructure protection and transportation systems. A DAS comprises a collection of (non-adaptive) target systems (represented as UML models) and a set of adaptations that realize transitions among target systems. Two sources of uncertainty inherent to DASs are: (1) predicting the future execution environment, and (2) using functional and non-functional trade-offs to respond to the changing environment. To address this uncertainty, we are inspired by living organisms that are astonishingly adept at adapting to changing environmental conditions using evolution. 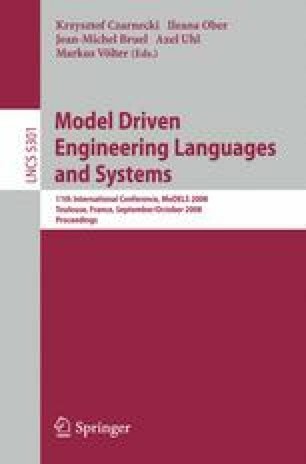 In this paper, we describe a digital evolution-based approach to generating models that represent possible target systems suitable for different environmental conditions, enabling the developer to identify the functional and non-functional trade-offs between the models, and then assisting the developer in selecting target systems for the DAS. This work has been supported in part by NSF grants EIA-0000433, CNS-0551622, CCF-0541131, IIP-0700329, CCF-0750787, Department of the Navy, Office of Naval Research under Grant No. N00014-01-1-0744, Siemens Corporate Research,and a Quality Fund Program grant from Michigan State University.